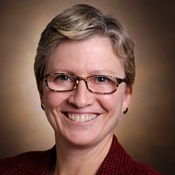 Carol A. Rauch, M.D. received her A.B. degree from Dartmouth College and her M.D. and Ph.D. degrees from Johns Hopkins University School of Medicine. Dr. Rauch took her residency training in Pathology and Laboratory Medicine at Yale- New Haven Hospital, where she also trained as the Winchester Clinical Fellow in Medical Microbiology. Since completion of her training, Dr. Rauch has served as the Medical Director of Microbiology at Baystate Medical Center in Springfield Massachusetts. For the past five years she has also served as the Chief of the Division of Clinical Pathology, where she oversees the clinical laboratories for a system of three hospitals and a reference laboratory. She holds faculty appointments at Tufts University (the parent organization of Baystate) and Yale University. Her professional interests include Bioterrorism Preparedness (she serves on the Governor's Bioterrorism Coordinating Council as well as many statewide and local planning committees). She loves teaching and enjoys the challenge of communicating with individuals of varied backgrounds.